Moving to a new house can be stressful and daunting for some people, so why not consider a removal company? If you live in Gateshead and are moving to a new house, Quicksilver Moving & Storage can be of service to you. Based in Newcastle, Quicksilver has many years of experience in the removals industry. You will always want to hire a removal company that is reliable and trustworthy to ensure that the service you receive is high quality. As members of the British Association of Removers, we follow the standards and regulations of the BAR body in order to ensure the quality of our removal services for all customers. If you are searching for ‘Removal Companies Gateshead’ then perhaps consider Quicksilver Moving & Storage, the leading removals company in the area. Get in touch with the Quicksilver team for a removal quote today on 0191 264 6677! Why Should You Hire a Removal Company in Gateshead? We understand that the removal process can be complicated and involve a lot of planning and organisation, which is why the team at Quicksilver ensure your move is entirely planned from start to finish, in order to reduce the risk of errors to an absolute minimum. Removal companies provide homeowners with a stress-reduced removal service that allows the customer to relax and focus on the new home themselves, rather than worrying about the old one. Many people decide to take care of the move themselves, which can incur a lot of problems over the moving period such as time constraints, loss of belongings and many other issues that will just cause stress to the customer. By hiring a removal company, this is all taken away and you will have extra time to get the new home ready for the move. Removal companies like Quicksilver also have years of experience in carrying out removals, meaning you will receive proper service from a team that has done this kind of thing many times before. If you are unsure as to who is going to help you move, it is probably best to hire a removal company, as they will have the expertise and knowledge required to make the move as successful as it possibly can be. Quicksilver also offers a full packing service for those who book a removal. 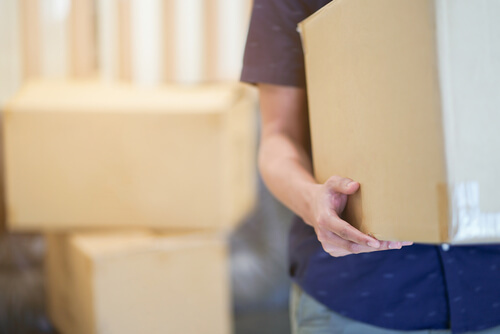 Packing up your personal belongings can often take a long time and be very stressful for the individual packing, so why not get someone else to take care of this for you? We have an experienced packing team who are provided with high-quality packing materials (that can be purchased from our box store) to ensure that items are packed securely and correctly. With your items packed by professionals, it makes sure that no damage is going to occur to any of your personal belongings. Hiring a removal company truly makes your life easier! There’s nothing worse than a rushed move, so be sure to plan well and be ready for your moving day. If you are hiring a removal company then make sure you book the move in at least a few weeks before it is scheduled to happen. This will allow them to prepare for the move and organise the day properly so that it runs smoothly. We all hate packing – it takes a long time, and can be very stressful if you have a lot of personal belongings. If you decide to do the packing yourself then ensure that you have this done well in advance before the day of the move. Otherwise, you may want to hire your removal company to take care of the packing for you. You should make sure that you have re-directed your post to the new address, as well as updating any relevant addresses. This will ensure that all of your stuff is sent to the new property. If you don’t do this then lots of your post will end up at the old property and you will have to discuss the collection of this with the new owner. Stressing about your move won’t make it any easier. Simply relax and do not worry too much. If you have hired an experienced removal company like Quicksilver then it makes it that little bit easier. Moving to a new house should be an exciting time, so don’t let the stress get to you. At Quicksilver, we also offer storage services to all of our customers at a competitive price. If you are moving to a new house then it is likely that you will have a lot of personal belongings lying about. This can make moving to a new house a complicated task for many people as they simply have too much stuff. We aim to make this process easier for you through our storage services. We offer storage for both residential and commercial purposes, so all types of customers can be catered to. Residential storage is commonly used for customers that are moving to a new house with us and want some extra room. It is also common if you own any seasonal items that are only used a few times a year – these can be stored when you don’t need them and taken out when you do! Our premises for storage are secure and well monitored by staff, so your items will be kept safe throughout the time you have them stored with us. We maintain an inventory system that ensures every single item is recorded, so we have a record of everything you put in storage. Common household items that are stored with us include sports equipment, garden furniture, household furniture and appliances. For affordable residential storage in Gateshead, choose Quicksilver. One of the first things you’ll need to do before actually moving to the new property is to pack up all of your items. Packing up your personal belongings before a move can often be stressful and take up a lot of your time. At Quicksilver, we understand that people are busy and therefore packing is not usually convenient for the typical person. We offer comprehensive packing services for those who are moving to a new house within Newcastle and the North East. As a full-service removal company, we always want to make sure that our customers are well looked after during their move. Our packing service does just that! Simply let us know your moving date and we’ll do the rest. Before the move our experienced team will come out to your property, ready to pack up your belongings. Using high quality materials, they will go through all of your items carefully and package them up in the relevant boxes. It is also important that you separate items into different areas of the room so that the packing team are able to package your belongings in the correct boxes. This will also make your life easier when you arrive at the new house. If you are looking for a removal company that won’t let you down, then Quicksilver is the perfect removal company for you! We understand that every move is as unique as the next and therefore provide every customer with a specialist and tailored service to suit their requirements for the move. From the initial quote to unpacking your items at the new property, the team will ensure that your move is dealt with professionally and to the highest standard possible. We serve the entirety of the North East for removals including Gateshead, Newcastle, Tynemouth, Gosforth, Hexham & all surrounding areas, so you’ll never have to look further for a removal company. Quicksilver is dedicated to providing customers with excellent service. If you need a reliable company to take care of your move, get in contact with us! If you are interested in our house removals service in Gateshead then please give us a call on 0191 264 6677. One of our team will be able to answer any questions you have regarding our services.